Come on circle, we can do this! VFX Sketch #20: Winners and Badges! Wow that looks really cool, love the style on it! Would love too see a breakdown how you did that later on. Looking forward to see what you’ll do with it. Hey @Axelorio, I wish it was the progress ^^. Sorry if the initial post was misleading. No worries Good luck none the less! I love the cell shapes Did you create them by subtracting? I’m a fan of the effect. 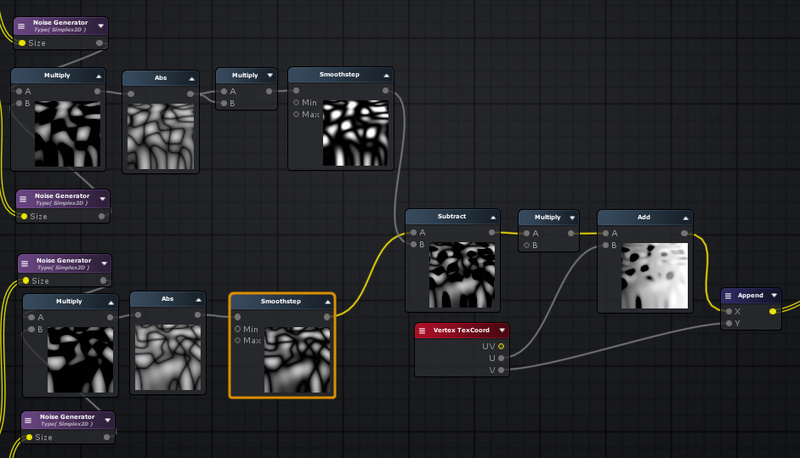 I know that using the 3D noise node you can also pan in the z channel. might be interesting for flames. that panning in the Z channel part is very interesting. When I’m quite happy with the result, it might be cool to experiment with one of those framerate munchers! Did some cleanup and a bit refinement too. added polarisation for a more cartoony look and made it work from all perspectives while still using only one plane to render on. that’s very interesting! how do you let it appear so volumetric (especially from above) while using only 1 plane? …And offsets the planes vertices downwards a bit when looking from above, so the base doesn’t appear to float while doing the move. First I was lerping between two images for top and side view, but that gives that two semi-transparent things when the angle is inbetween. So fading UV distortions before the image input seems to prevent that. how did you made these functions in material? thats awesome !!! I think to let the fire pop a bit more, I would use a darker background and add some darker tones to the pedestal like if some coal would lay on it. Then, the fire should be way more visible. Hey @Applaz_YB I tried to clean it up already, got stuck with a strange tiling problem when unifying the top and side UVs before the 2 noise functions. So atm I have 2 seperate pairs of noise to distort the circle UVs. Def got to cut these down. Then I’ll be happy to share the process! Shouldn’t have gone that far astray for this contest though, at least the sidetracking gave me hope to wrangle the 3d flame into two noise functions again. Thanks for your feeback @simonschreibt, will definitely apply that - your entry rocks hard btw! It’s logical yet so genius… i have to learn a lot still… Great job! wow.i am looking forward to your final result.